Lightbox’s big-gun premiere next month will be season two of The Son. Spark’s streaming service also is picking up 2017 British thriller In the Dark and Cheers successor Abby’s. 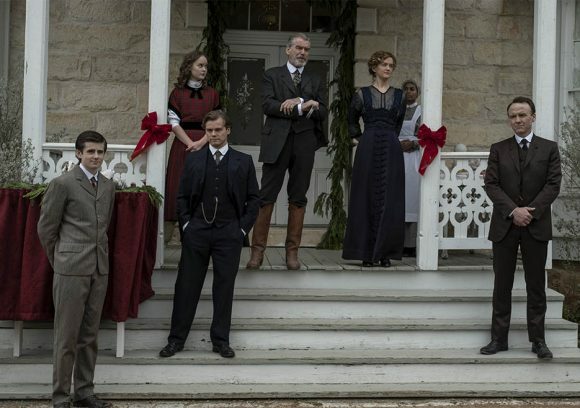 The Son (weekly from May 1) will conclude the journey of the iconic “First Son of Texas”, Eli McCullough (Pierce Brosnan), who will stop at nothing to secure his legacy against the backdrop of the nascent oil industry of 1917. His tools are deceit, fraud and murder – weapons he wields with the effortless skill of the Comanche warrior he once was. But the biggest challenge he faces will be quelling a civil war under his own roof, triggered by his idealistic son. Eli knows the ultimate prize of American dynasty is nearly in his grasp, and time is running out. It opens in 1851, when young Eli is now married and a respected warrior among the Comanches, and introduces a 1988 timeline when Eli’s granddaughter is confronted with a long-buried family secret. In the Dark (from May 27) is a four-part Danny (Come Home) Brocklehurst adaptation of the books by Mark Billingham, about a detective who faces two of her most testing cases on the eve of motherhood. “The BBC’s new crime drama doesn’t break the mould with its themes of corruption, lies and unwanted pregnancy – but its dark strands still draw you in,” The Guardian said. MyAnna Buring (Ripper Street), Emma Fryer (Kill List), Ben Batt (The Go-Between), Matt King (Peep Show), David Leon (Vera) and Ashley Walters (Top Boy) star. 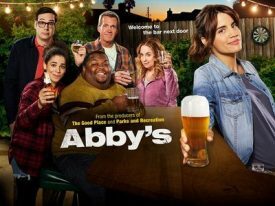 Natalie Morales (Parks and Recreation), Neil Flynn (The Middle) and Nelson Franklin (The Office) star in Abby’s (weekly from May 2). About a woman who sets up a garden bar in her own backyard, it went to air last week in the US, where it earned mixed reviews. “It’s not a wildly funny show — I laughed out loud only a handful of times — but the jokes feel less important than the chance to spend time each week in the company of some appealing goofballs,” Rolling Stone said. Also new to Lightbox next month will be The Big C (May 22), Joanna Lumley’s India (from May 3) and Stargate Infinity (from May 9). You used to list the new Lightbox movies – I assume that these are still coming in their usual windows. Otherwise, it seems there is less new content coming through on Lightbox? Hey, Mike. 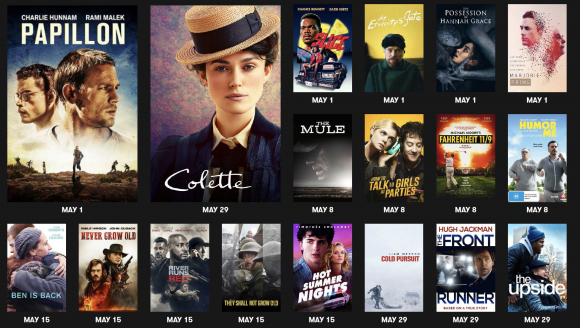 Have just updated post with movies to rent. I stopped including them a couple of months back because I felt the emphasis should be on TV content that was exclusive or new to Lightbox rather than the new movie releases it shares with every other streaming platform. But happy to respond to reader demand. Re Lightbox being light on content: Even Spark recognises it needs to offer a stronger slate, hence the announcement it’s looking for a partner to grow the service (as you alerted us to earlier in the week). Phil, what chance do you reckon of Hulu or CBS All Access entering the market to partner/take over Lightbox? Hulu would have obvious synergies given a lot of their exclusive content ends up on Lightbox but I don’t think they’ve expanded outside of North America from memory. I’m guessing CBS All Access would like a foothold here given they now have a tie up through Australia. Only other one I can think of would be if Stan (Australia) fancied a dip in NZ water? Despite a number of major players signalling global roll-out strategies, it’s hard to imagine their feasibility in a market as small as ours. CBS All Access is the most likely, but Hulu is planning to expand internationally, Disney/Fox, Warners and BBC/Discovery are preparing their own international streaming services, and even the Sundance Channel has announced Down Under aspirations. But how can any of them gain a significant foothold in our market given the dominance of Netflix, the rise of Amazon Prime, the growth of Lightbox, the cranking up of TVNZ OnDemand, the rebooting of a 4K Sky under more digitally aggressive leadership, the launch of Spark Sport, and the pending arrival of another big brand, Apple TV+ (which experts expect to struggle here)? The tangle of programming rights in this part of the world notwithstanding (Apple TV in NZ still doesn’t offer TV shows to stream), will Kiwis be willing to fork out for more than three of these subscription services? The Australian newspaper recently published an overview of the challenges facing new streaming services and although the site’s paywall-protected, the article has been summarised here. Most studies show that households typically subscribe to no more than 3 services. And the total spend doesn’t typically change. The lastest Deloittes media trends doesn’t indicate things have changed much. https://www2.deloitte.com/insights/us/en/industry/technology/digital-media-trends-consumption-habits-survey/summary.html. What would Lightbox give those possible partners that they couldn’t achieve by launching direct (given there are almost no barriers to entry for a new streaming service)? Where is the value add to those partners – they would be contributing the valuable content and Lightbox brings … ??? Interesting discussion and links, thanks folks. Mike, I think the value is in not starting from the ground-up. Lightbox already has a subscriber base (albeit including inbuilt Spark subscribers) … I would imagine that’s rather enticing rather than starting from ground zero. Sorry Clint, I have to look at this from the buyer’s POV. Only Spark (and anyone reading the IM) knows how many paying subscribers there are from the 355,00 Lightbox subscribers – the only financial information is that disclosed is that revenue doubled in the last HY. And that coincided with the introduction of PPV. Clearly the revenue from Lightbox is not material otherwise it would be disclosed in Spark’s financial reports – lesser revenue generating units are reported (Cloud, security and service management earned $8m in FY18, Managed Data and Networks $4m, Lightbox ? Not disclosed). A non-paying customer base has no value – might as well buy a customer list from Flybuys or someone.